Apologies in advance for these photos, done in low light with a phone. Oh, well. Last night I finished the top to the Slow Quilt, and I’m happy with it. It’s big: 70″ square. It’s going away for a while, until I can get the right batting and find some inspiration for the quilting. 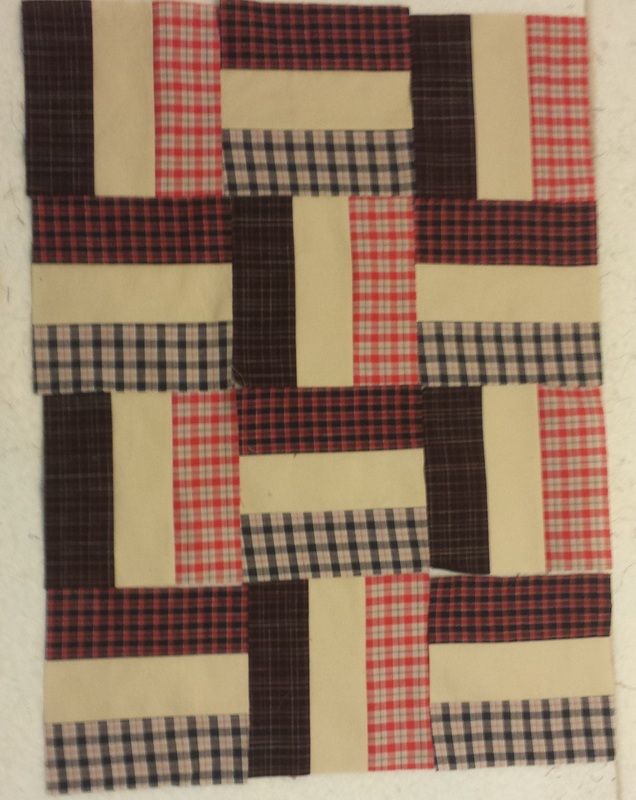 All that careful piecing wore me out. While catching up on blog reading, I spotted this post from Amanda Jean at Crazy Mom Quilts. 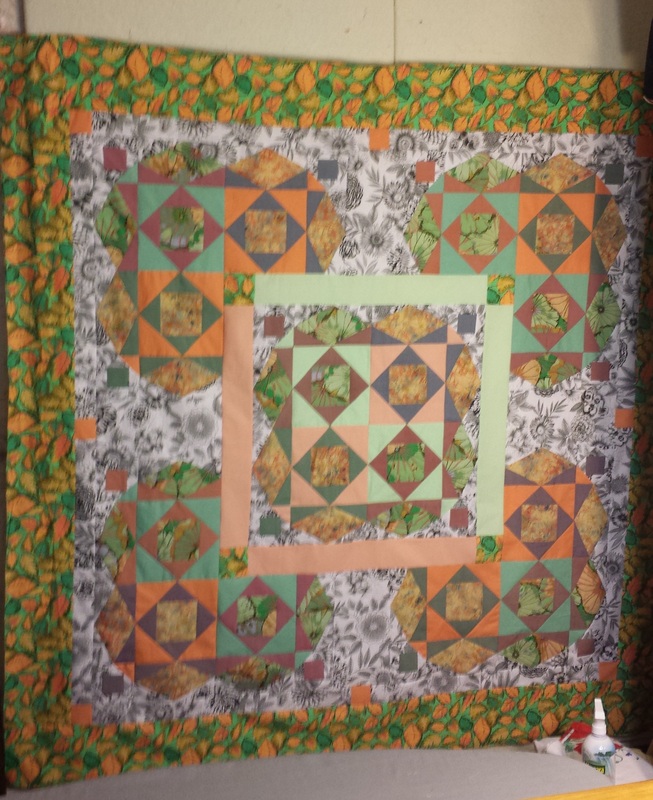 It’s a quilt along for charity (Margaret’s Hope Chest) using the Rail Fence design (talk about Zen piecing!). She also mentions that they really need boys” quilts. This started working in my brain and I couldn’t wait to get to it. 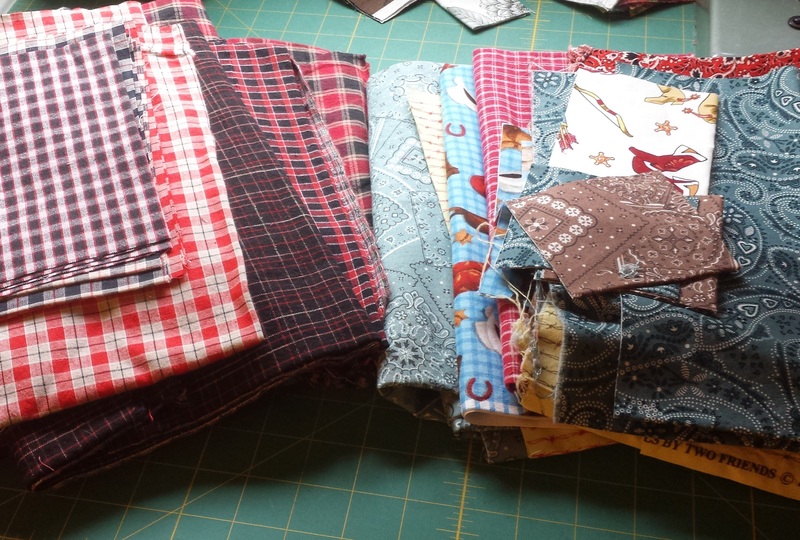 Of course I have overflowing scrap bins, but the “boy” thing made me remember that I had a whole stack of plaid yardage left from a long ago quilt (he’s 31, it was his HS graduation…). In the same drawer I found all my cowboy yardage/scraps. (What, you don’t have a plaid/cowboy drawer in your fabric closet? Well, maybe I won’t, either, when these are finished!). I am jumping the gun on this. Amanda doesn’t look like she’s even going to start cutting for a few weeks, so there’s plenty of time. But I had the house to myself on a rainy Sunday, so I started to play. I started to realize that all those plaids were going to be chaotic and horrible a little busy jammed together in a Rail Fence, so I added khaki Kona. (Now that I look at it, I think maybe the reason these plaids are left over is that they do have khaki stripes and threads through them, and I used the more white ones in the other project…) So, I think this is working, don’t you? I did actually cut the strips pretty straight, I just have them crooked on the wall. So that’s what I’m doin today, blissfully piecing strips and whacking them into blocks. Check out Amanda’s post and join me. Categories: Uncategorized | Tags: Crazy Mom Quilts, Design wall monday, Evening in the Garden, rail fence, Valerie Root | Permalink. I’m glad you used that fabric for your borders, Valerie. It works really well. Great size too. I love the way your quilt top turned out! And yes, those plaids sure needed a solid. That quilt top is stunning!